The Caterham Seven will be immortalised in Lego form for the first time when a brand new set is launched later this year. The set will allow Lego and car fans the chance to build their very own miniature version of the iconic British sportscar. Here’s how the Lego Caterham came about. The concept was submitted to the Lego Ideas system. Ideas which receive 10,000 votes of support from Lego fans are then considered by the Lego Ideas Review team, which selects the ideas that will make it through to production. Lego builder Carl Greatrix submitted the Caterham concept and gained 10,000 votes between May and September 2015. Check out the video below to learn more about the review process and the other nominees. Lego also previewed the next batch of ideas that are up for review, and that Series 40 Toyota Land Cruiser looks cool! “Carl is known in the Lego community for his photo-realistic models of cars, trains and aircraft. He’s perfectly captured the classic British sportscar in Lego bricks and now you’ll be able to own one too,” said Mike McCoy from the Lego Ideas team. “Lego is one of the most iconic toy brands in the world so to have our car recreated in the legendary bricks is an enormous honour. The great thing about Lego toys is that they are timeless – it certainly isn’t just children who love it; we have a few of our team members who are avid fans despite being well into their 40s. If you know someone who has always wanted a Caterham Seven, you can now tell them you’re getting them one,” joked Caterham chief commercial officer David Ridley. 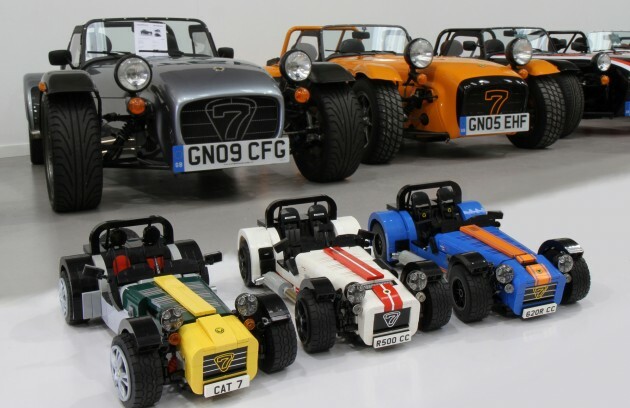 With the product still under development, the exact styling details, colour scheme and retail price of the Caterham Seven Lego set are yet to be confirmed. It will be available in toy stores across the UK later this year. The toys pictured here are prototypes created by Greatrix and are not representative of the final product. Lego is used to working with car brands. The Danish company and Ford unveiled Lego sets of the Mustang and F-150 Raptor at the Detroit show in January, and other cool brick sets include one of the classic Mini Cooper and this complex Mercedes-Benz Arocs 3245 set from the Lego Technic range. Of course, there’s also the Shell-Ferrari collections that Malaysians love. Not sure about you, but I’m getting myself a Caterham Seven. Finally. Wow…Tony Fernandez sure looking forward this. Masyuk.. Soon we can buy it in the flight.. Previous Post: Lotus Exige Sport 350 set for Malaysian debut soon?